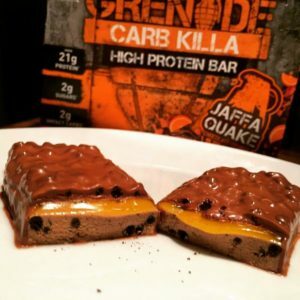 After much hype, the guys discuss and review the Carb Killa protein bars from Grenade, a UK supplement company. The claim of best protein bar is in constant flux among the fitness population. We’ve stated over and over again that our top choice for taste and texture is OhYeah! ONE Bar. 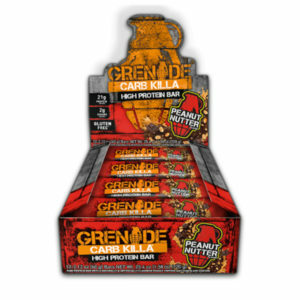 But, everytime we post a protein bar review on our YouTube channel, we’re told to check out the Carb Killa Bar by Grenade. So, we did some digging into this bar to see what it’s all about, and even bought most of the flavors to try after hearing all the hype. We’ve got all the info as well as our full review ahead of these baked, protein bars. But long story short… we’re not sure what the big fuss is all about. Most of the flavors we tried didn’t taste that great! Carb Killa Bars are a conglomeration of ingredients familiar to those who’ve had a protein bar a time or two before. Most of the ingredients in here will be very familiar to you protein bar vets out there. Carb Killa leads off its protein bars with a trio of milk-based proteins composed of calcium caseinate, milk protein isolate, and whey protein isolate. This gives the bars a mix of slow and fast digesting proteins and hopefully brings the bulk of the protein content to Carb Killa, because the next two forms of protein are less than ideal inclusions. How is calcium caseinate different from the typical micellar casein? Calcium Caseinate is another form of casein that differs from Micellar Casein (the type usually found in protein powders, in the way they are manufactured. Caseinate is produced from insoluble portion of milk protein. So, to get it soluble the caseinate is reacted with Calcium (an alkaline substance) which increases the mineral content of casein (giving it a higher calcium concentration than micellar) and increases is solubility. Overall though, Caseinate is inferior to Micellar Casein because it’s denatured during manufacturing. Note: Micellar Casein is produced without the use of chemicals. Polydextrose is a polysaccharide that’s partially fermented in the large intestine, and considered a non-digestible type of soluble fiber synthesized from sorbitol, glucose, and citric acid. It’s often used as a sugar substitute, but it’s not very sweet like sugar, which may be one of the primary reasons these bars fail on flavor big time. We’re thinking this is where much of the 7g of fiber in these bars is coming from – and it’s definitely more of a “fiber” than IMO Fibers in other bars (see discussion below). Gelatin a.k.a. hydrolyzed collagen, is made from the collagen contained in the bones, connective tissue, and skin of animals, (sounds tasty doesn’t it?). Rather than using IMOs (isomalto-oligosaccharadies) as a binding agent / sweetener, Grenade is using a mixture of Gelatin and glycerin to hold these bars together and provide a “gooey-ish” type texture. Gelatin can also provide some protein, although it’s not a highly bioavailable source of protein and isn’t in the main protein blend listed above, so we’re not concerned about having it there (if the bar were solely based on gelatin protein then we’d be disappointed due to poor amino acid profile, but this is fine here). We think it’s mostly used for the binding in Carb Killa. Another less than ideal form of protein in Grenade (what’s up with these Brits and their inferior protein?!) is soy protein isolate. While it’s not the worst thing to include in a protein bar, overconsumption is a bad idea. Given that it’s not the primary protein here, it’s fine — it’s way down on the ingredients list. We just don’t want to take over 25g of soy protein in a given day. 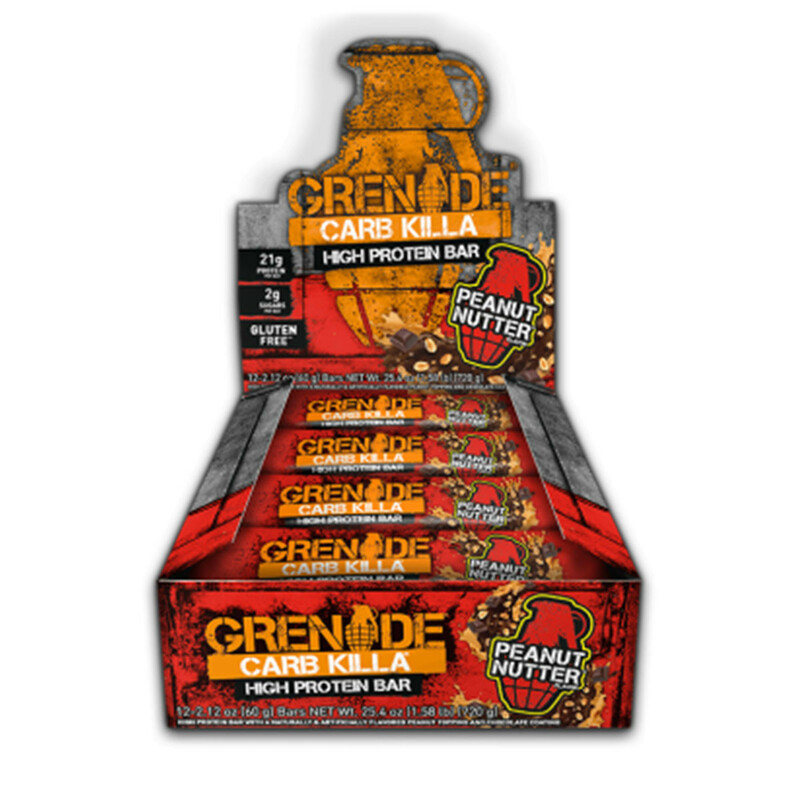 If Grenade really wanted to include a plant-based protein in their bars, we would have preferred them to use Pea Protein, which boasts a full amino acid profile, and doesn’t bring about hypogonadism in high doses! But pea protein also tastes like… peas.. so maybe not! Just be careful though, with consuming too many sugar alcohols (like xylitol) which can cause severe GI distress in some individuals. Each Carb Killa bar packs 23g of protein alongside 210 calories. Of the above flavors, really the only ones we could get behind was chocolate cream…barely. 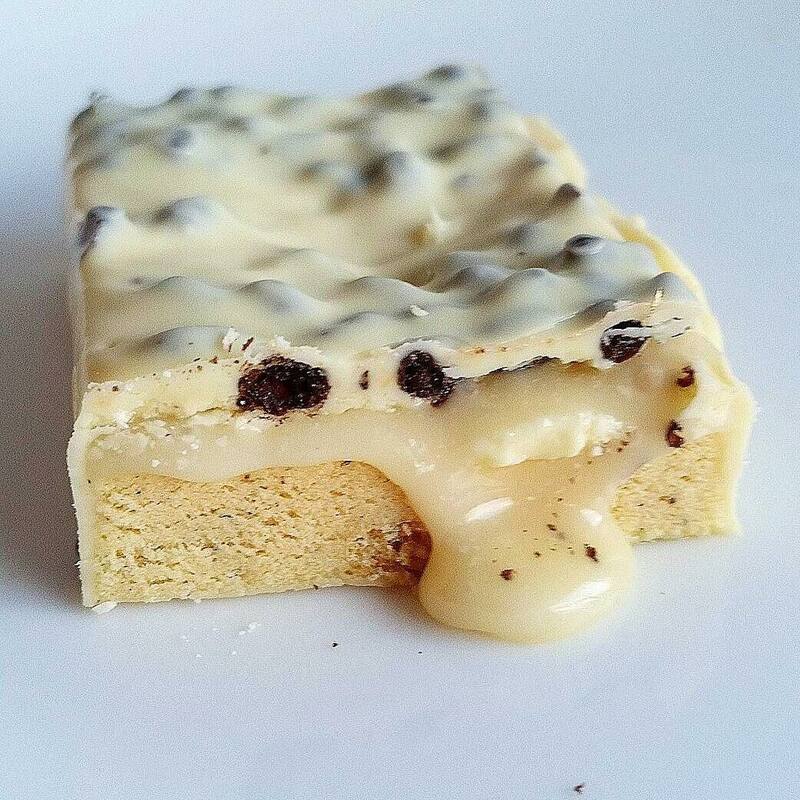 Well, after much hype, we can say with certainty that the Carb Killa bars fell flat for us. As you’ll see in our review video, flavoring on these bars is severely lacking, and that may be due to the flavor preferences between Americans and Brits. 1 Comment | Posted in New Products, Supplement News | Tagged Calcium Caseinate, Grenade, Milk Protein Isolate, Polydextrose, Protein, Protein Bars, Soy Protein, Whey Protein Isolate.